Small children often find losing their first tooth very exciting. 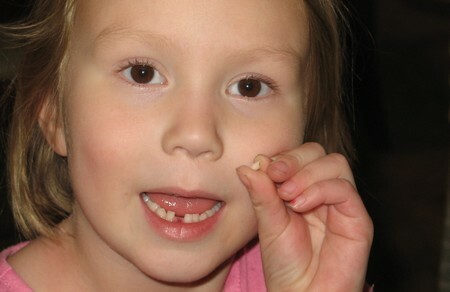 Losing a tooth remains a rite of passage for children. Typically the process doesn’t present any complications, but sometimes your child might not be able to pull a loose tooth on his own. If the tooth doesn’t appear ready to fall out, never force it to loosen; instead, wait until it is ready. But if the tooth causes pain, check with a dentist to have it removed professionally and safely. Wash your hands carefully with an antibacterial soap. You don’t want your child to intake germs as you stick your fingers into his mouth. Keep your child calm before pulling the tooth. Massage the gum area around the tooth of the child to ease any discomfort. If the tooth looks infected or the gums look swollen, do not pull it out. Make an appointment with a dentist to have it removed professionally instead. Ask your child to open wide. Wiggle the loose tooth gently back and forth. Repeat these steps as many times as needed, until the tooth is as loose as possible. The more ready the tooth is to fall out on its own, the less uncomfortable it will be. Avoid common tooth removal myths such as biting hard into an apple or tying the loose tooth to one end of a string and the other end to a doorknob and then slamming the door. Gently pull out the loose tooth with your fingers. If it refuses to budge, continue to gently ease it forward and backward with your thumb. Once the tooth is extremely loose you can pull it out—or it might even fall out naturally. Ensure you remove the tooth from its root to avoid infection and not leave bone fragments in the gum, thus ensuring perfect growth for the new tooth. Prepare for blood. Your child might experience some bleeding from the gums once you remove the tooth. If so, have the child lean forward to avoid swallowing the blood. For added comfort, place a wet washcloth inside the freezer for a few minutes until cold, then apply the cloth to numb the newly exposed gum. Apply pressure to the gum with a clean washcloth pad until the bleeding stops. If the bleeding doesn’t stop within 15 minutes, seek professional medical help. Make sure the tooth is naturally ready to fall out on its own. Never forcefully remove a tooth because the tooth’s root will not come out with it. If the root does not come out when you pull the tooth, check with a dentist to avoid the risk of infection. Make sure to keep your child’s teeth clean to avoid oral problems with bacteria affecting the newly exposed gum.